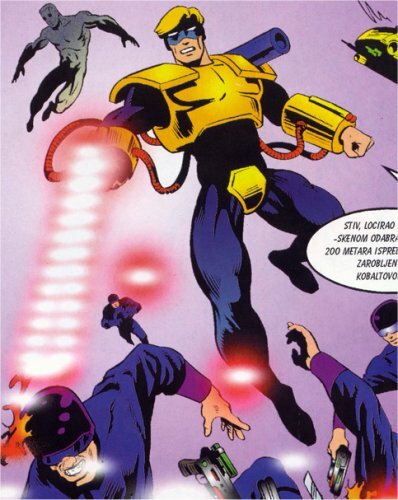 Powers/Abilities: Sajbernaut is able to fly, and wears wrist gauntlets which allow him to fire beams of energy. Mounted on his left shoulder is a larger calibre weapon of some variety. 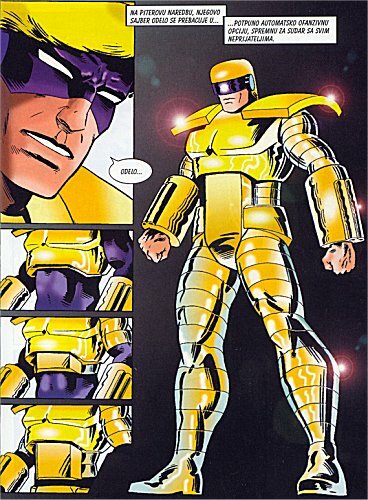 Portions of his body are protected by armour, and he can extend this to grant greater protection when desired. History: After being murdered by the villainous Kobalt, Peter Tesic and his wife were revived by the scientific genius Nikola Tesla, and transformed into superhumans. Peter became Sajbernaut, the leader of Nikola's new team of heroes, Generacija Tesla.